I’ve recently been working with a couple near Cardiff who live in a Grade II list barn near Cardiff. 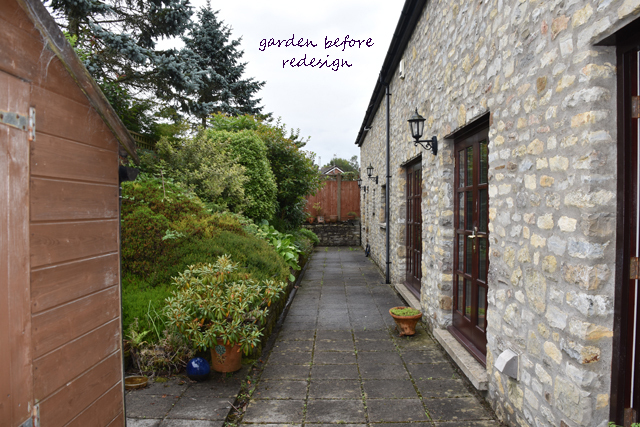 They’ve lived in the house for years but, having recently renovated the inside, now want to make the garden at the back of the house much more inviting and inspiring. It’s a challenging site in that it faces north and only gets snippets of sunshine throughout the day. There’s also a large bank of soil taking up most of the space and because the only access for construction is through the garage, it will make the clearance and construction work a rather labour-intensive procedure. Added to this is the issue of drainage which currently consists of a slot drain which runs the length of the garden, in the middle, and is directed to a drainage system that runs under the garage. It works well now so we have to ensure that any new drainage works just as well. My vision is that the new drainage will be part of the design aesthetic, rather than just a functional element. There are some lovely decorative covers available so this should be very easy to achieve. 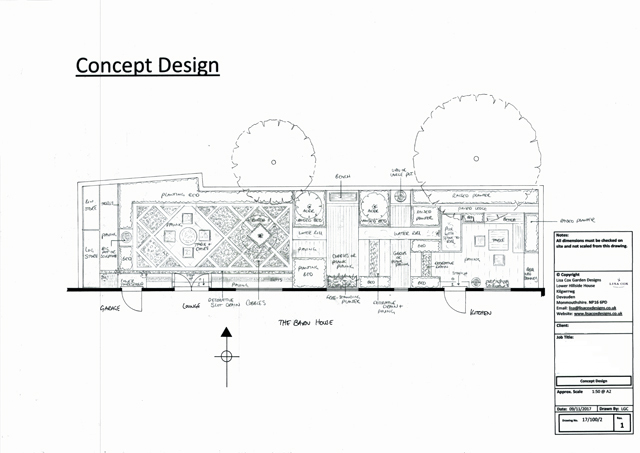 The conceptual design for the new garden is very much inspired by their frequent visits to Italy. They love the cobbled streets and secret courtyard gardens of Rome and want to bring an element of this to their own garden. The plot itself is long and thin and it can be tricky with a garden of this shape to make it enticing when you look out from inside. Because it’s a barn conversion, there are many viewpoints from inside so we decided that dividing the space into a series of “rooms” would help to make it interesting from all angles. One of the key views is from the hallway as there is a large full height window that is the main focal point when you come through the front door. I’d love for them to feel connected to the garden form the moment they step into the house. 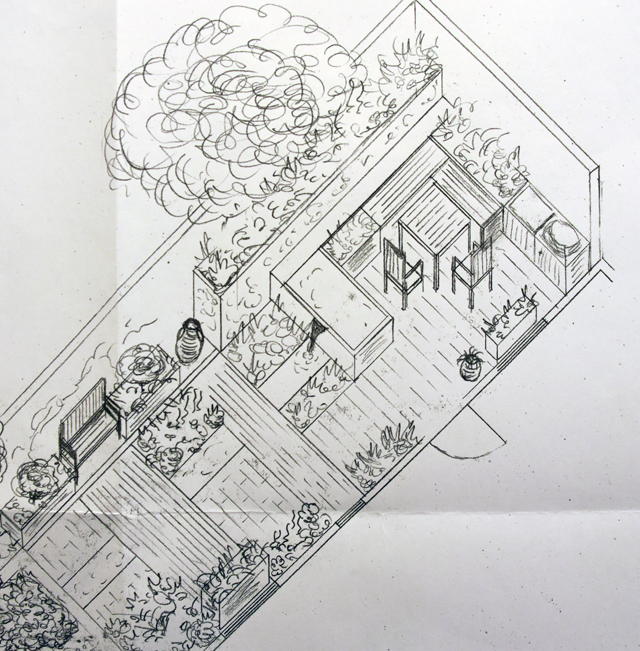 The axonometric sketches hopefully give you a flavour of how the garden will look and feel. These were based on an earlier version of the conceptual design so some of he detail is different, but the essence of the design hasn’t changed. Taking away the bank of soil will obviously create a much more usable space, but it will also require quite a significant amount of construction in the form of retaining walls. We plan to use a mix of render and stone to give the space a bit more light, whilst also linking it back to the age and history of the barn itself. With any garden it’s so important that each part of it has a reason for being. But this is even more important in small spaces because, generally speaking, you can see it all in one go. The water rill will help to connect the areas together whilst also providing interest within each zone. My aim with this garden is to bring interest to every corner of the garden so that every square inch is utilised. 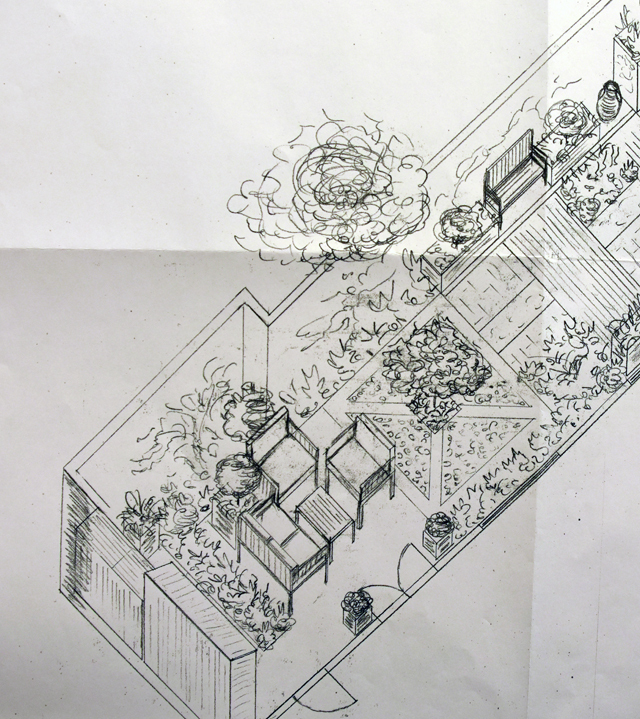 I’m so looking forward to seeing this built – it’s going to completely transform the garden!